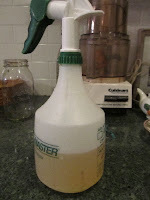 creative savv: Citrus-infused vinegar cleaners -- all-natural, totally safe, and did I mention cheap?! 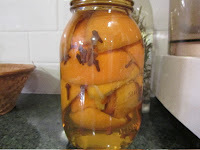 Citrus-infused vinegar cleaners -- all-natural, totally safe, and did I mention cheap?! Are you looking for an all-natural kitchen and bath cleaning product, that is totally food-grade and can be used around food, on your cooktop, in the microwave, in the refrigerator, on your floors, in the bathtub/shower, on non-stone kitchen counters, on light switches, and many other places you put your food or hands, or you breathe? 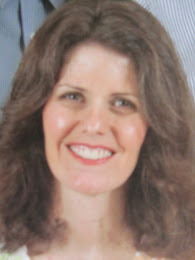 I lost both of my parents to cancer, at far too young an age. Whatever I use to clean with, I want to be completely safe. When it comes to cleaning solutions, probably the worst health effects come from inhaling overspray, and ingesting chemicals which get on food/beverage/dish and glassware. Here's a homemade cleaning solution so completely safe, I can spray it in my fridge, while food is still in there, and wipe down the shelves. I slide food items off to one side, spray and wipe. It's that safe. I don't wear rubber gloves while spraying and cleaning. I have no fears that chemicals will penetrate my skin. I don't worry about inhaling the overspray. I use it as a spray cleaner in the tub, wipe out with a clean cloth, and don't bother with a rinse (in fact it's better if you leave this on the surface of the tub, it will slow the accumulation of soap scum). This product is my favorite for our vinyl kitchen floor. Mopping is a breeze. I have my handy-dandy Swiffer with dish towel cover, spray a 4 foot by 4 foot square of floor, and mop it up. I used to absolutely hate mopping. This smells so pleasant to me that I actually enjoy mopping now. I'll be totally honest here. This is not a heavy-duty cleaner. If you've badly neglected your stovetop or shower, you'll need reinforcements for this cleaner. For that, if you want something super safe, no harmful chemicals, no ammonia, no fumes, etc, you're going to have to use some muscle, maybe a good share of baking soda, a scrubbing brush, a mesh scrubbie (like an onion bag), this cleaner, and perhaps some liquid dish detergent (but not mixed with the vinegar solution, but after the vinegar and/ or other cleaning solutions). 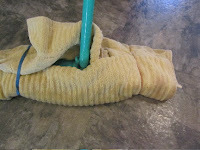 What this is, is a general kitchen and bath cleaner for daily and weekly use, when you're doing a wipe-down of surfaces. It's the kind of cleaner I grab for wiping fingerprints off of the fridge door. It's good on stainless, porcelain and enameled steel. So, what's this amazing cleaning solution made from? Vinegar, orange peels, whole cloves and water. Vinegar is the age-old household cleaner. It's readily available, non-toxic at 5% acidity, inexpensive and it works. The orange peels and cloves vastly improve the aroma and add cleaning power. This has a very pleasant orange-spice scent, with a hint of the vinegar (which dissipates when dry). I can mix up a 40 ounce bottle of this solution for about 40 cents. Citrus peel contains a component that works as a degreaser and solvent, limonene. Limonene is the compound in orange peel that manufacturers use for fragrance in perfumes and cleaning products. It also works to dissolve oils. The orange oil found in the peel, is used in "green" pesticides, especially with ants and termites. The oil not only kills these insects, but will block the pheromone trail that ants lay down, preventing new ants from "finding" your house. The addition of cloves to this concoction is primarily for scent. However, cloves do have minor antiseptic, anti-fungal, antiviral and antimicrobial properties. Vinegar, itself, is antibacterial and antifungal. It kills approximately 80% of mold varieties. And when used as the final rinse on bath/shower surfaces, vinegar will slow the recurrence of soap residue (rings and scum). And it's a mild solvent and degreaser. It can also be used to destroy ant pheromone trails. Score and peel 4 oranges, and add to a 1 quart canning jar. 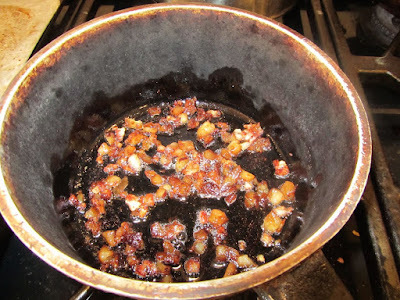 Add about 1 tablespoon of whole cloves to the jar. Fill with white vinegar and cap. Top off the vinegar a couple of times in the next day or so, as air bubbles come to the surface, exposing the orange peel. Store in a cupboard, pantry, or on a non-stone countertop (vinegar etches granite, marble and quartz stone products). then strain through a couple of layers of cheesecloth, a piece of muslin or a paper coffee filter. For most purposes, mix 50/50 with water and pour into a spray bottle. For very stubborn dirt, like the inside of the oven door, spray or pour, full-strength on the opened door, wait 15 minutes, come back and wipe. 1) Do not use vinegar on any stone surface, such as marble, granite or quartz (Silestone). Vinegar can etch the surface and cause permanent damage. Best to use a mild dish soap and water for stone. If you are unsure if this will harm your surface, read up on cleaning info for your particular surfacing. If vinegar is okay, then this product will be safe. 2) Do not add bleach to this solution. Mixing vinegar and bleach will release toxic chlorine gas, damaging your mucus membranes. If you do feel the need to use both a bleach-based product and a vinegar one, rinse between the change in product application. A rinse will eliminate your risk of waging chemical warfare upon yourself. Later in the year, as spring approaches, I like the house to smell of lemons. A lemony aroma lifts and energizes me. I'll be making a lemon and herb infused vinegar for my spring cleaning in early March. Do you make your own household cleaners? Do you do so for "greener", healthier products?Or is saving money your motivation for making your own cleaning solutions? Now can you guess what I was doing yesterday? I cleaned the kitchen and bathroom, of course! 1/12 Just an update -- a reader emailed asking if she could add some castile soap to this recipe. I looked into it, and the answer is no. When you mix vinegar and any soap (castile or otherwise), they work against each other. Here's the explanation and link to read more. Also, I don't advise mixing this vinegar solution with liquid dish detergent. It won't be dangerous, but you'll lose some the cleaning power of the vinegar and the detergent. Dawn dish detergent, for example has a ph of 7.44, which makes it a base. White vinegar has a ph of about 2.0, an acid. The acid and the base will neutralize each other, possibly rendering the solutions less effective. 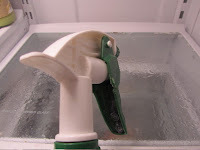 The detergent will still have it's surfactant properties, but you'll have better cleaning results if you use a detergent first, then follow up with a rinse of the vinegar solution. Thanks TJ, for the question. Hope that clarifies things. My son can't stand the smell of vinegar. Maybe I'll have to try this to see if the oranges mask it enough for him. Some people are just sensitive to odors. I know a woman who makes her cleaner with oranges *plus* the peels from 1 lemon, as her husband doesn't like the smell of vinegar either. She thinks the lemon helps "hide" the vinegar scent even more. I haven't tried this out, so can't compare. 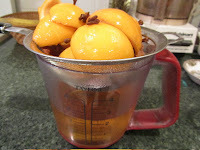 If you try this and add a lemon, just make sure no pulp is still attached to the peel, as most folks who use whole lemons, juice them, instead of peeling and eating. But for me, I don't really smell the vinegar in mine. I used to use plain vinegar to keep the shower clean, but stopped because that end of the house always smelled like a salad. 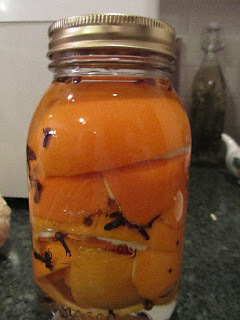 With this orange and clove infused vinegar, I only get a faint whiff of the vinegar, and that's gone once it evaporates. I first want to say I am sorry your lost your parents too early. In my family there have only been two lost to cancer, the rest have heart disease so I'm very aware of what affects us today. I usually just use vinegar for most of my cleaning purposes, I thought about adding essential oils, but they are so costly, thanks for this as I will try this soon. I love the smell of lemon and it deters certain bugs so this will make a nice overall cleaning product. I originally switched to natural cleaners for the health reasons both for my family and the environment, but love the savings that come from it. One tip I'd like to share with you, if you don't mind, came from a researcher who couldn't tolerate bleach for cleaning her work spaces. She found that spraying with vinegar then Hydrogen peroxide killed more germs/bacteria than bleach. This wouldn't necessarily help in cleaning, but if you have issues about germs this would be the way to go say in the bathroom or cutting surfaces, as you can simply spray and walk away, no need to wipe. Ohh, I use hydrogen peroxide, too! but I've never thought to spray it after the vinegar. Thank you for that tip! I'll try that! Hydrogen peroxide is excellent on mold that forms on the grout in the shower. I dab it on with a cotton swab, on any tiny spots developing. I also like to pour a capful around the drain in the bathroom sinks a couple of times per week. Seems to take care of anything living on the edge of the drain. because I'm a very curious person, and always want to know why something works, I looked up the two substances. Lois, has it right, spray vinegar, then spray hydrogen peroxide. Don't do as we're often prone to want to do to take short-cuts, and mix the two together in the same bottle. When mixed the two substances form peroxyacetic acid, which is corrosive and can cause lung irritation. But by spraying the two substances separately, you avoid these complications, but retain the effectiveness of the two products. And it appears that the two products used separately are more effective when separate, than when mixed together, anyways! According to the article at the link that I'll leave below, vinegar, then hydrogen peroxide will kill more bacteria (including salmonella, shigella and e.coli bacteria) than chlorine bleach or other kitchen cleaners. Impressive! I already use vinegar + essential oils but I'll definitely try this. Soudns lovely. We always joke that we always fancy a plate of chips (Fries to you North Americans) after I've finished cleaning. Jessica, that's funny about the chips (fries). I was using plain vinegar all summer as a daily spray in the shower to combat mildew. That end of the house always smelled of salad. So what essential oils do you use in vinegar? Is there an amount of drops per quart or litre that works best for the scent?